Sources claim that a few Ryzen 3000-series CPU samples have arrived at Radeon Technologies Group in order to tune the GPU drivers for the new interconnects. Tests have revealed that the upcoming CPUs are faster than the i7-8700K from Intel, but are very unstable and crash very often at the moment. AMD’s Ryzen 2000-series CPUs launched this year do not really represent the second Zen generation. 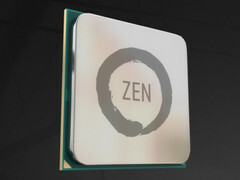 This latest generation was more like a transition between the Zen 1 and Zen 2 microarchitectures (The Ryzen 2000-series is codenamed Zen+, after all). The red team is expected to launch the 7 nm Zen 2 (Ryzen 3000-series) CPUs in 2019, and, according to a HardOCP forum member, 7 nm test samples are currently tested at the Radeon Technology Group labs. These 7 nm Zen 2 samples popping up at AMD’s RTG may seem questionable, since Radeon is mostly dealing with the GPU side AMD’s business. However, the reason given by the HardOCP sources is that the CPU samples include new interconnects and RTG needs to update the video card drivers. According to _mockingbird on the HardOCP forums, the Zen 2 samples have 8 cores / 16 threads, and the default clocks are set at 4 GHz (boost clocks going up to 4.5 GHz). They are compatible with DDR4-3600 CAS 15 and was tested together with a Radeon RX Vega 64 LE. Even though the exact model is unknown, it appears the sample is already faster than Intel's i7-8700K, so this might actually be a 3500/3600 model rather than a 3700. Unfortunately, these samples were quite unstable and crashing all the time, prompting engineers to restart the tests several times. It remains to be seen if the Zen 2 chips will indeed be compatible with the current AM4 sockets. AMD was adamant that the AM4 motherboards are more future proof, but, as with any new CPU family, there will be at least a new chipset update.